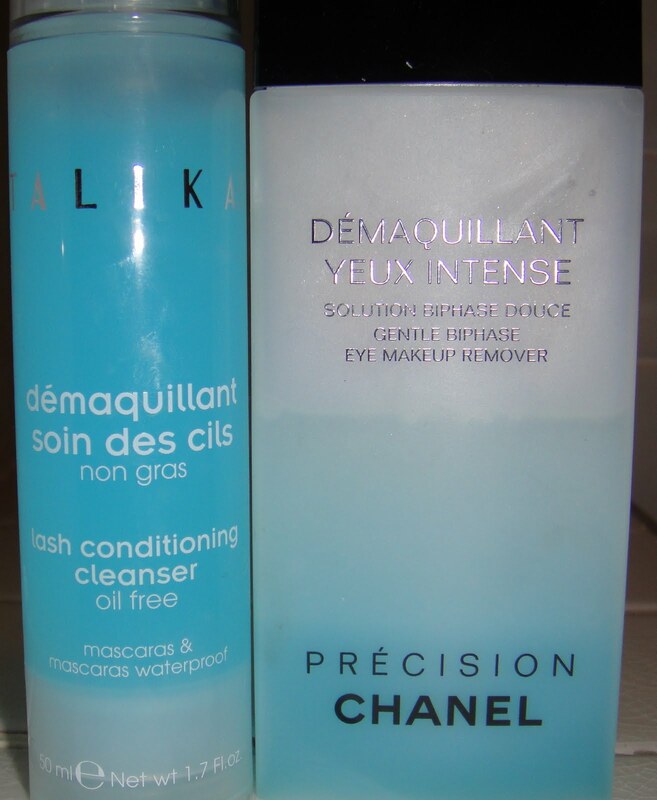 Here we have Talika lash conditioning cleaner (which I got free in a SpaceNK goody bag), and my personal bottle of Chanel BiPhase eye make up remover. Once again, we have an oil-free formulation (the Talika) and an oil based one – the Chanel. At this point I’m wondering why all eye makeup removers have to be blue? A lot of them use cornflower extract, I’m almost certain that won’t make things blue, but I digress somewhat. 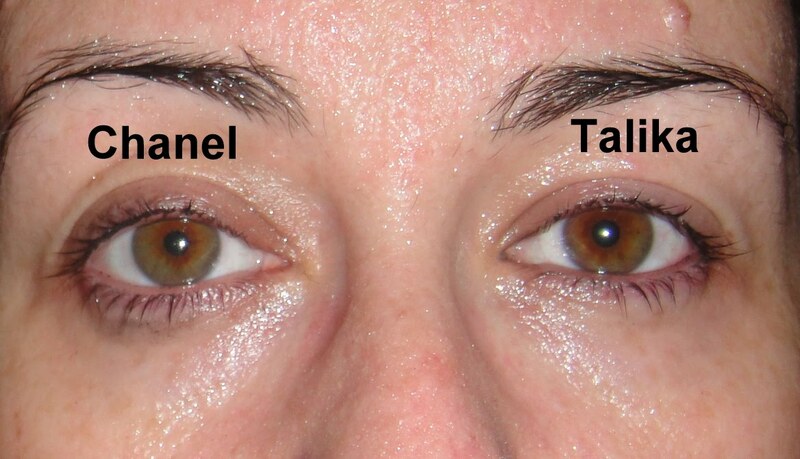 Talika claims theirs is the first oil-free formulation to work on waterproof mascara, and says it strengthens and lengthens lashes, I’m only testing the first of those claims, but I’m intrigued by the second! 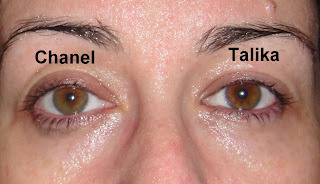 Chanel claim: that it “Removes makeup perfectly from the lashes and the eye contour, leaving the skin soft and supple. Combines effective makeup removal with respect for the delicate eye area.” I’m on about my fourth bottle of this stuff, and I love it. 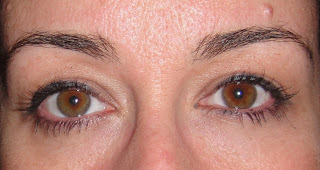 Again, three shades of shadow – over a primer – and mascara. No idea what happened to the focus here, sorry! Yes, definitely the Talika is ahead here. Round one to Talika. Results-wise, the products are neck and neck here, it looks like they’ve both cleaned the eye-area well, but I’ve noticed that the Talika has left the eye area feeling a little tack-y to the touch, and slightly more taut than the Chanel. There is no stinging from either. 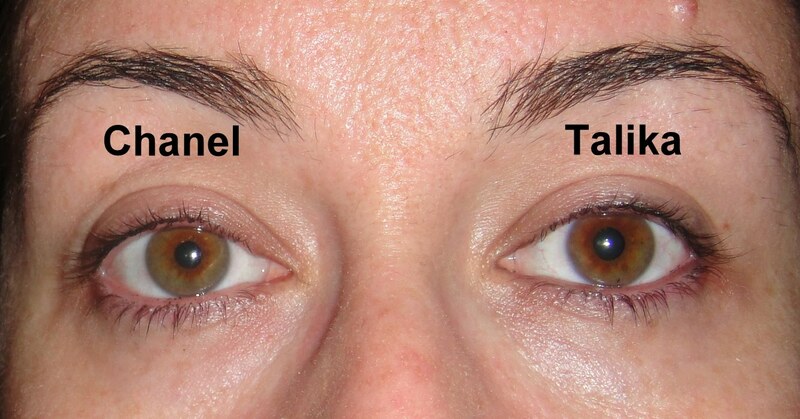 The Chanel has a very definite smudge of mascara! I’m devastated. Seriously! 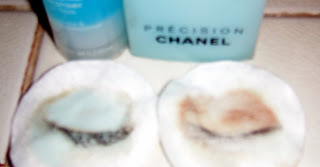 I’ve been recommending it as the best eye makeup remover for as long as I’ve been using it! Coco, how could you? Next week, Amie Vs Talika an all oil-free remover final. I’m deeply surprised! What? Chanel is beaten? Do I have to change my eye makeup remover now? Does it remove that indelible gel eyeliner from MAC though? 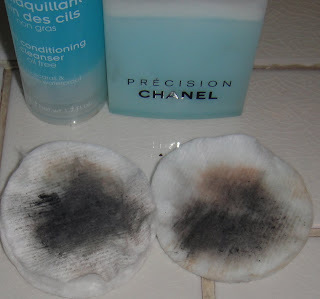 I almost bought the Chanel eye make up remover the other day… went for the Clinique Take the Day off instead. I can't use the Clinique, LLT! It BURNS, and leaves red rings of scaly skin around my eyes.